Bach’s masterpiece, “Mass in B Minor,” has left posterity struggling for superlatives to describe its scope and impact. In 1881, the Swiss composer and publisher Hans Georg Nägeli called it “the greatest work of all times and all people.” Others compare the Mass to Michelangelo’s ceiling of the Sistine Chapel. 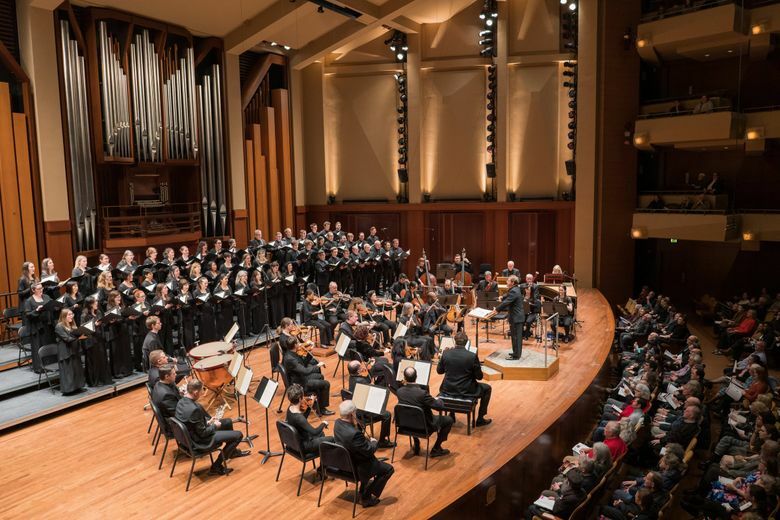 No wonder the Seattle Symphony’s Ludovic Morlot programmed this work as a milestone for his final season as music director. Thursday’s first of three performances was gratifyingly good: strong leadership from Morlot, impressive singing from the soloists and chorus, virtuoso instrumental performances from the orchestra. Full of quicksilver changes and challenges for all the forces involved, this mammoth work makes your average Mass seem like a walk in the park. Nothing about it is easy or routine. Because the orchestra is relatively small (fewer than three dozen players), all the intricacies of the score are exposed, in music that stops and starts and shifts like quicksilver. The choral singers need the utmost alacrity and clarity to do justice to the often-convoluted lines of Bach’s brilliant choruses. The four vocal soloists (Jane Archibald, Meg Bragle, Kenneth Tarver, and Andreas Wolf) were well chosen. The “Domine Deus” duet of Archibald and Tarver, with the singing underlain by a delicious mixture of instrumental timbres, was particularly fine. Bragle was the surprise of the evening in a remarkably moving “Agnus Dei,” full of subtlety and feeling. The chorus, prepared by Joseph Crnko, did a heroic job in some of the most difficult choral singing in the repertoire. At one point late in the performance, where the music was scored for “double chorus,” the choral singers disconcertingly left their positions on the risers during a brief pause. (“What? They’re leaving?” murmured a nearby concertgoer.) They reassembled in a new configuration, probably to facilitate the “double chorus” designation, but the effort could have been spared; there wasn’t much difference in the “before and after” choral sound out in the hall. The instrumental solo work was terrific — notably Demarre McGill’s exquisite flute, Mary Lynch’s beautiful oboe and oboe d’amore, Noah Geller’s well-judged violin, and Jeff Fair’s noble French horn. The continuo players, the vital force underlying everything, couldn’t have been better: Jordan Anderson (bass), Efe Baltacigil (cello), Joseph Adam (organ), and Jillon Stoppels Dupree (harpsichord), chief among them. Go if you can; the sheer imaginative beauty of this masterpiece and its interpreters will reward you. Melinda Bargreen, a Seattle Times reviewer since 1977, is a composer and author. She can be reached at mbargreen@gmail.com. This report is supported, in part, by the Rubin Institute for Music Criticism, San Francisco Conservatory of Music, and the Ann and Gordon Getty Foundation.